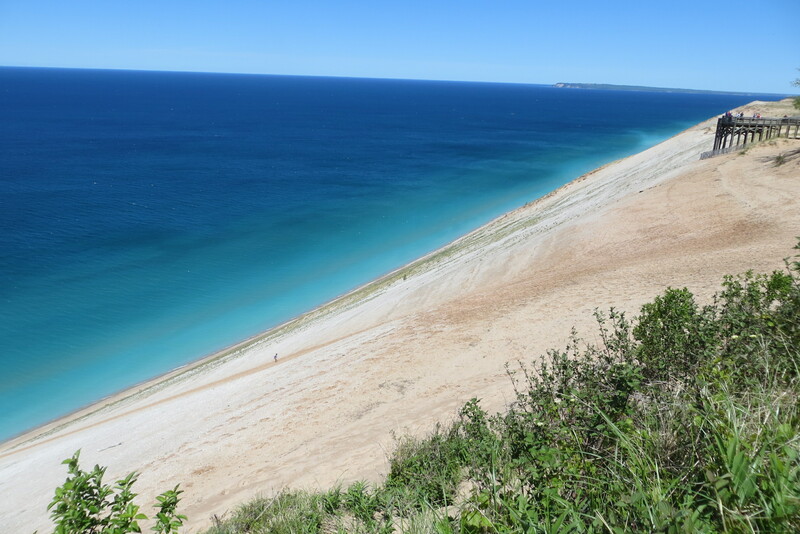 We spent today exploring the area around Traverse City and first on our agenda was the Sleeping Bear Dunes National Lakeshore on the northwestern shore of Michigan’s Lower Peninsula. 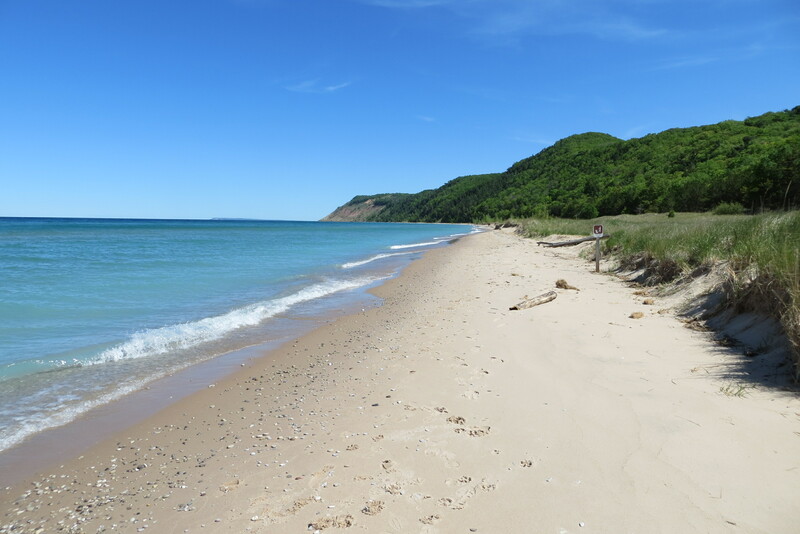 This large park, so named by the Chippewa Indians, is made up of dense forests, lakes, sandy beaches and most famously the towering sand dunes overlooking Lake Michigan. You can’t see the bottom as the slope is too steep. If you look closely you will see a girl climbing back up-all 450 ft! Who put a Chubby in my Mary?! It was smoked fish and actually very tasty, a meal in itself. 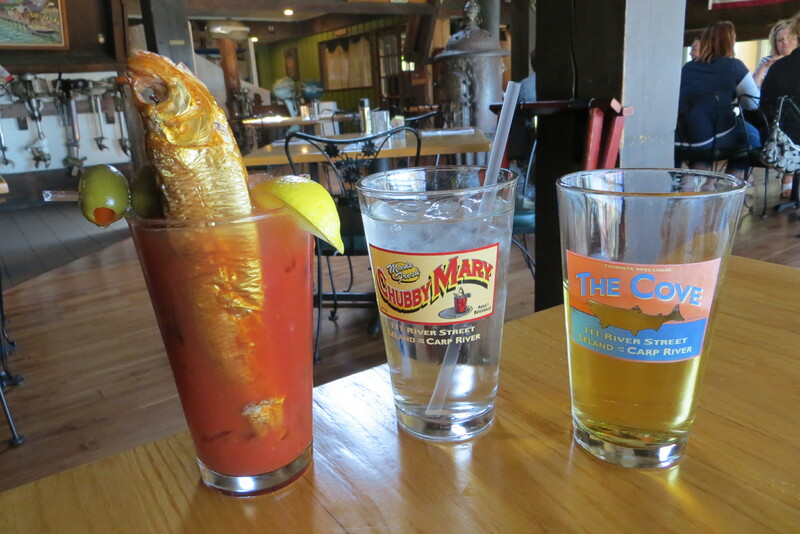 Why not have Chubby Marys as lunch! 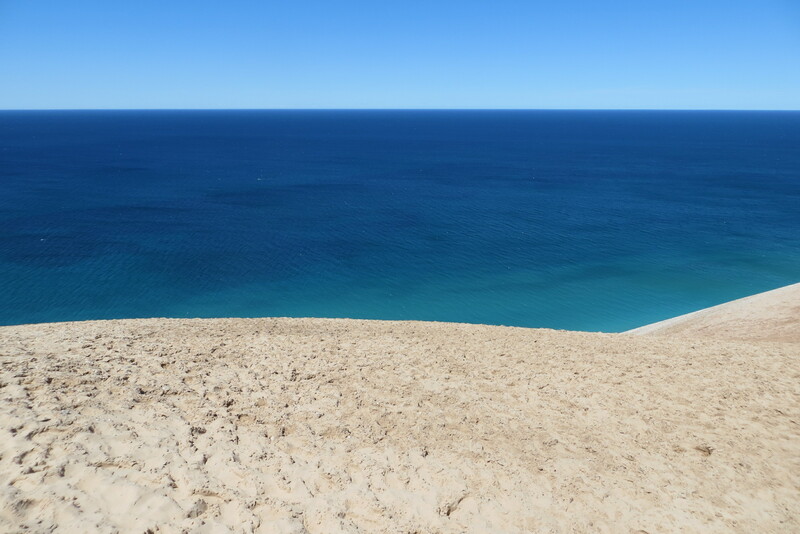 As you walk onto the massive dunes overlooking the lake the view is stupendous, and it appears to be a shear drop off. There is a sign warning not to go too close to the edge because sliding down to the bottom will result in a 2 hour climb back up! We climbed up to a vantage point and were able to see all the way down to the shore below, and 3 small moving dots – hardy folks starting the slow climb back up. 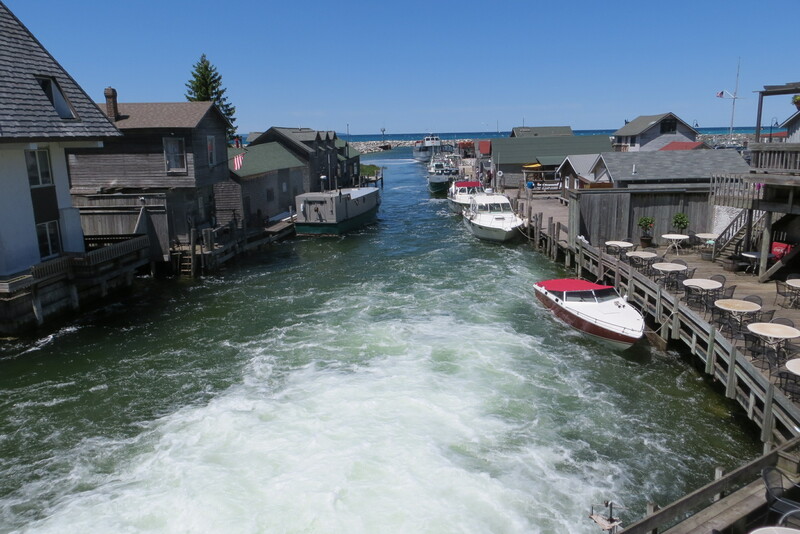 Next we found the adorable little fishing village of Leland where we had a great lunch at The Cove, famous for their whitefish and their Ghubby Marys. We tried both and loved them. This entry was posted in Mid-West Summer 2015. Bookmark the permalink. Chubs have become nonexistent on the Wisconsin side of Lake Michigan due to some issues with Lake Michigan. 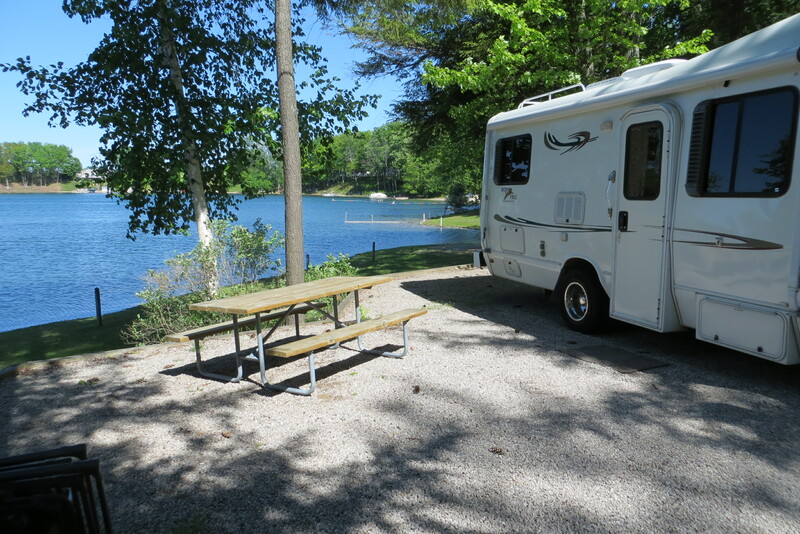 One of Gary’s favorites, now you have him interested in your travels! 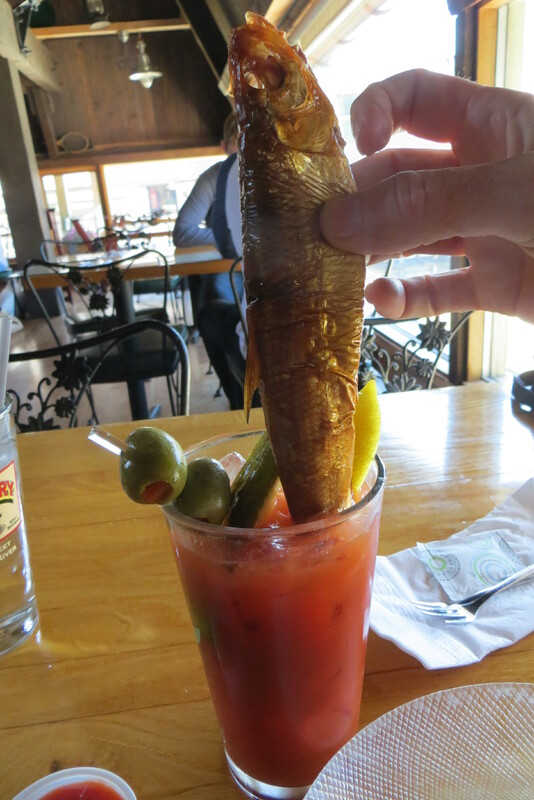 That looks like a hellofa Bloody Mary! LOL. It would be fun to make them a regular thing. It all looks gorgeous, that is, of course, with the exception of dead fish in your cocktail. Really… isn’t that taking the idea of a ‘dirty’ drink just a little too far? Yes, we knew there was something fishy about it when we ordered it. Stunning – both the view and the fish.